You can also download the entire As You Like It translation as a PDF! Orlando explains how his elder brother Oliver mistreats him. Oliver urges the court wrestler Charles to harm Orlando. Rosalind and Celia watch as Orlando wrestles, and defeats, Charles. Rosalind and Orlando fall in love. Rosalind and Celia discuss Orlando. Duke Frederick banishes Rosalind. Rosalind and Celia decide to flee in disguise. Duke Senior is living happily in the forest. He hears how Jacques is feeling melancholy and goes to meet him. Frederick discovers that Celia has left with Rosalind and Touchstone. He sends for Orlando's brother Oliver. Adam tells Orlando to flee to the forest to escape his brother and the duke. Adam offers him companionship and money. Disguised Rosalind and Celia, and Touchstone, hear Corin and Silvius discussing love. Rosalind and Celia buy a cottage. Jaques is enjoying feeling melancholy, and has Amiens sing to him. Jaques comes up with a song of his own. Adam is starving and exhausted. Orlando promises to go and find food for him. Jacques tells Duke Senior that he has met Touchstone. Orlando ambushes the men, but the Duke freely offers him food. Frederick confiscates Oliver's lands, and promises to banish him if he cannot find his brother within a year. Rosalind (as Ganymede) sees Orlando hanging poetry on the trees, and offers to help cure Orlando of his love-sickness. Touchstone flirts with Audrey and accepts that he must marry her to win her love. He asks Sir Oliver to marry them. Celia teases Rosalind about Orlando. Corin invites Celia and Rosalind to watch Silvius's attempts to woo Phoebe. Silvius begs Phoebe for her love. Rosalind (as Ganymede) rebukes her. Phoebe falls in love with "Ganymede." Rosalind and Jaques discuss melancholy. Rosalind then tests Orlando's love by berating him without breaking character. Orlando has failed to meet "Ganymede." It turns out he has been injured saving Oliver's life, and is recovering. Touchstone and Audrey discuss marriage. Touchstone humiliates William, Audrey's suitor. Oliver has fallen in love with "Aliena." "Ganymede" promises Orlando that he will marry Rosalind, and sets up a plan. Touchstone and Audrey prepare to get married. They stumble upon some of Duke Senior's pages, who sing for them. The couples marry. 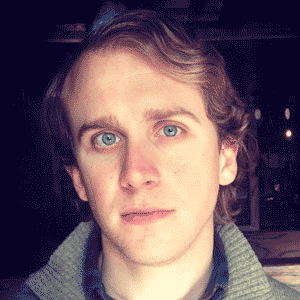 Frederick becomes a religious recluse, reinstating Duke Senior. Jaques leaves before the celebration. Cosby, Matt. "As You Like It Translation." LitCharts. LitCharts LLC, 11 May 2014. Web. 21 Apr 2019. Cosby, Matt. "As You Like It Translation." LitCharts LLC, May 11, 2014. 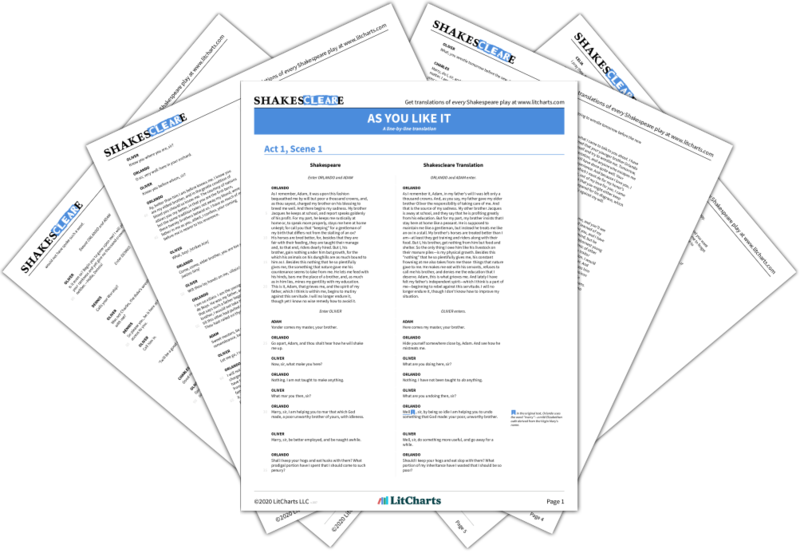 Retrieved April 21, 2019. https://www.litcharts.com/shakescleare/shakespeare-translations/as-you-like-it.